You will need to have periodic Ob/Gyn checkups so your practitioner can make sure you and your baby stay healthy. These visits are a great time for you to ask questions. We would also like to share some valuable information with you. 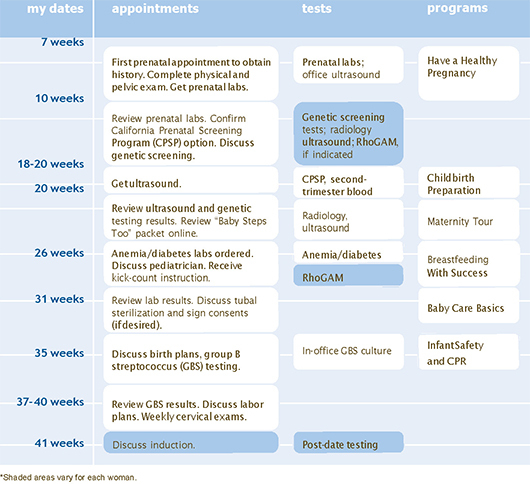 Please download the following files, and take a look before your prenatal visit. We also have a companion (mobile) website to assist you during your journey. Please go to www.kpmybabyandme.org to sign up. Download PDF in English. Requires Adobe® Reader. * You may attend these classes in any order. Please register in advance by calling 1-888-988-2800. † These are approximate timelines and should be used as general guidelines. ‡ Shaded areas vary for each individual.